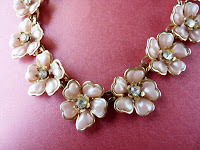 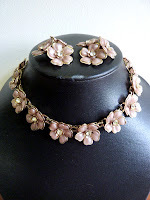 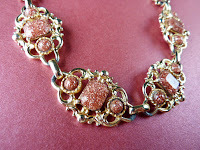 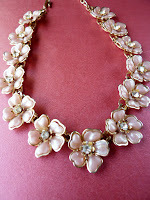 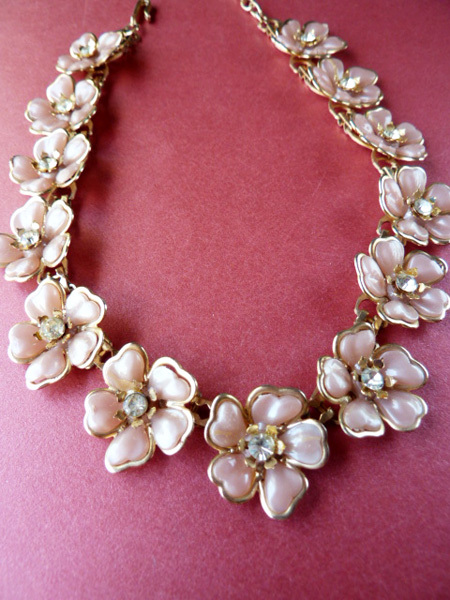 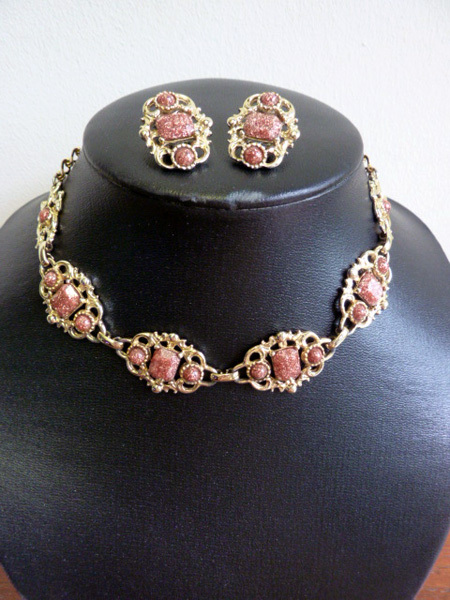 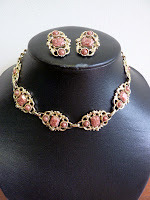 Necklace and earrings are in fine-good condition, there are small signs of rusting on the goldtone metal settings. 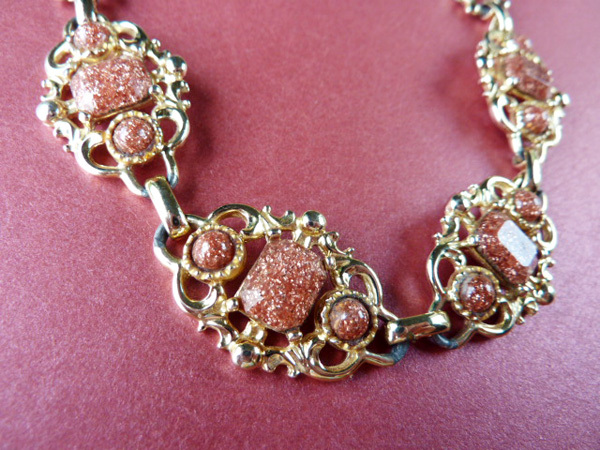 Dulling on the plating and rhinestones have some aging. Gentle shade of light mauve-brown floral petals in thermoset lucite, all parts are riveted, each petal has a rhinestone set in a pointy edged cup. 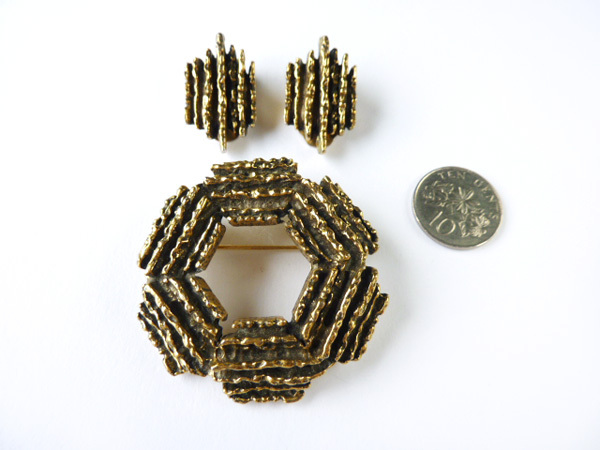 Lots of dimension to the piece. 1950s. 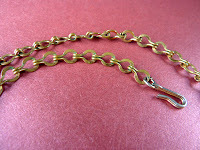 Necklace is in good condition, the chain has patina as it is brass, some wear on the hinges (normal, revealing greyish metal) and on the back's plating. 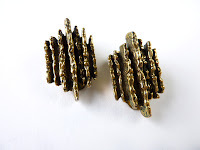 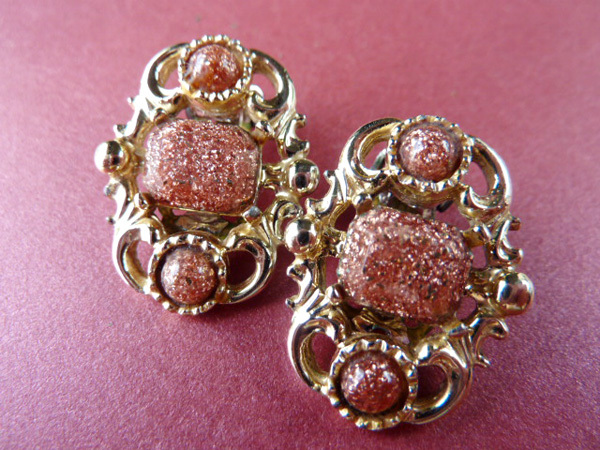 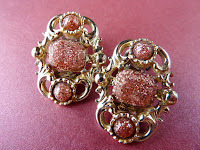 The earrings are in fine-good condition, earrings have chipping on the underside of the clips due to verdigris (has been mostly cleaned off, please see photos). Some wear on the goldtone backs. 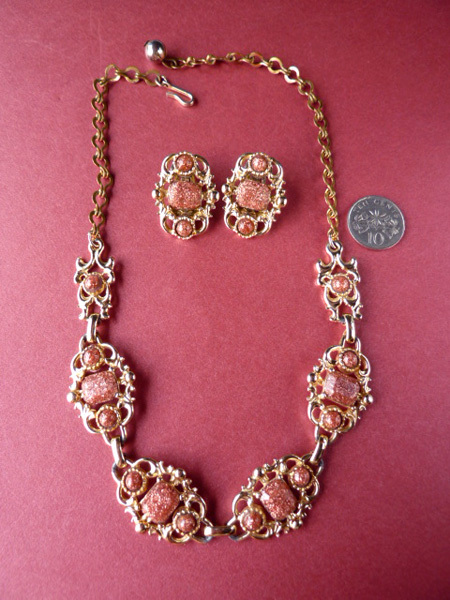 The fronts of both necklaces and earrings are alright, it includes brown glitter glass cabochons set on a scroll design, in pale gold-plating. 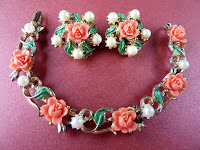 1950s. 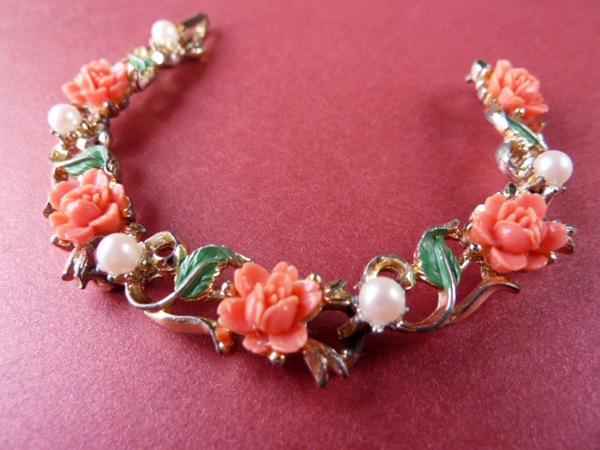 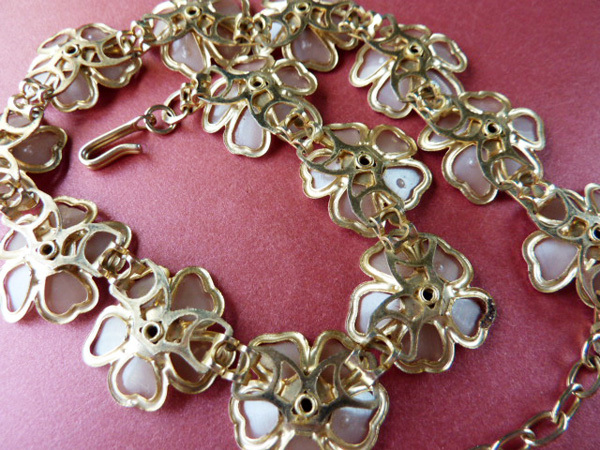 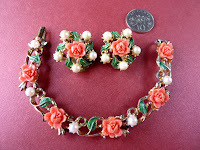 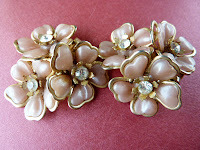 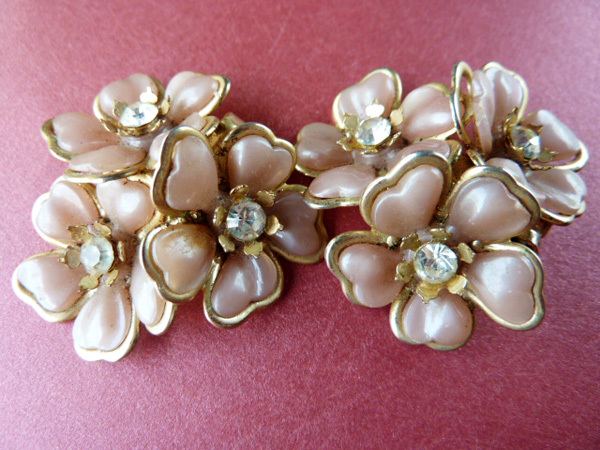 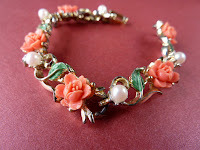 Fine condition, bracelet has replaced new faux pearls, they are a pinkish hue. 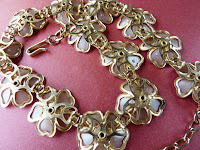 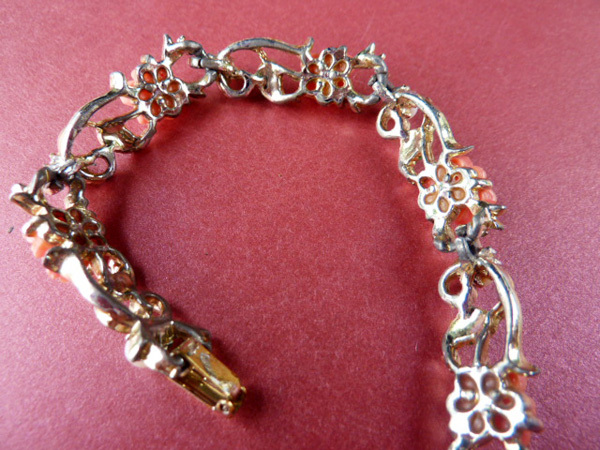 The plating has shown wear on the pale gold-plating revealing a greyish base, on the backs, edges and sides, it has been worn quite a bit whose previous owner probably loved it to death but the set still has some life left in it, as you can see it is a very pretty design with no problems to the flowers and leaves! 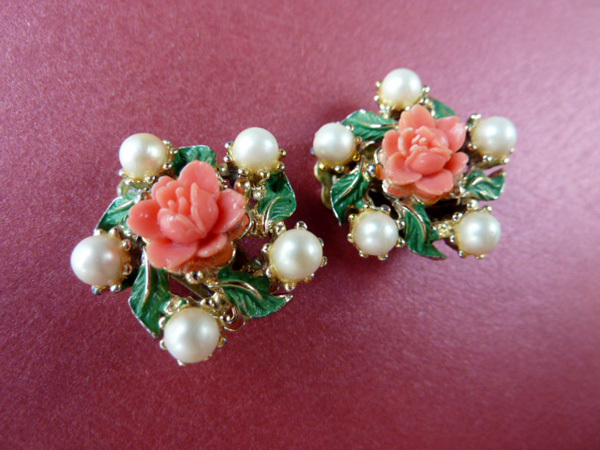 The tops have coral-coloured celluloid flowers, likely Japan in origin, with painted green leaves. This bracelet is short and will fit slimmer wrists. 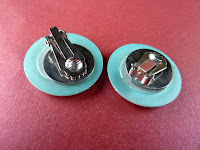 The earring clips have quite some wear on the backs and chipping on the plating due to verdigris (already cleaned off) but the fronts are very nice. 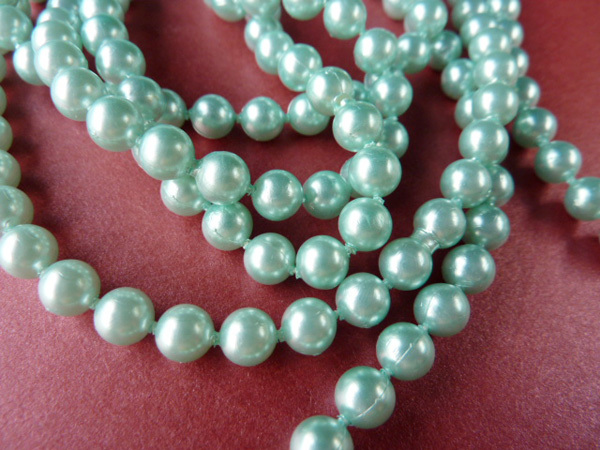 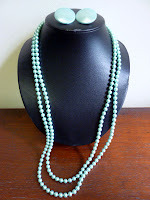 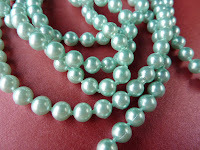 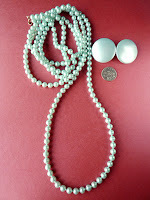 The faux pearls here are original and are off-white with a satin lustre. 1950s. 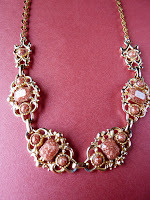 Very good - excellent condition. Necklace has aging on the clasp, earrings looks like it was not worn before and the clips are still tight. 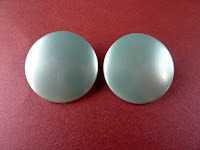 They are made of plastic in aqua green. 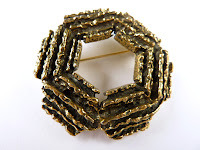 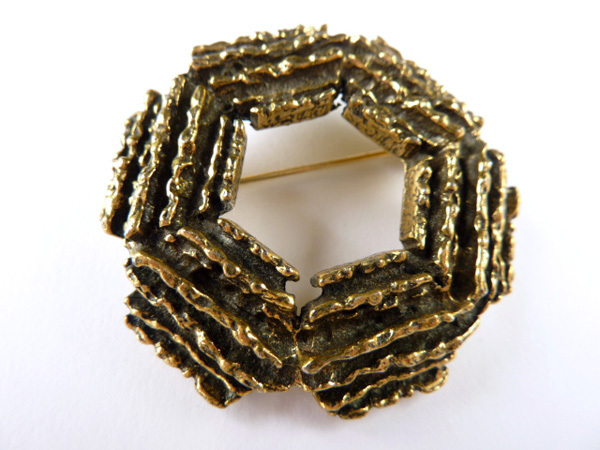 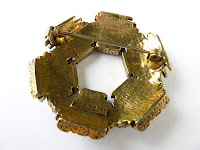 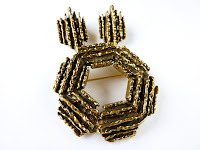 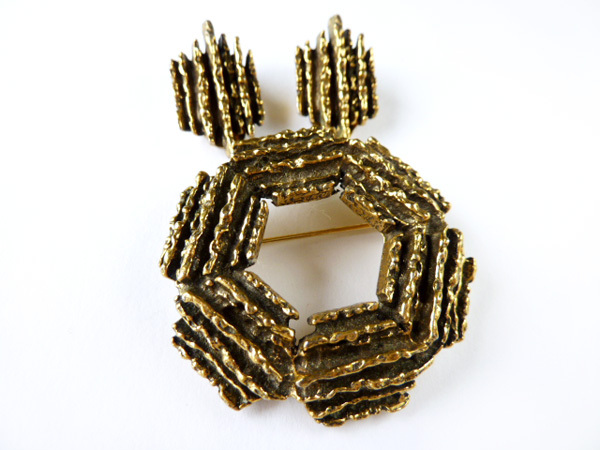 Signed 'ZENTALL' on the brooch, earrings are not signed. Very good condition, slight aging and wear on the pieces. 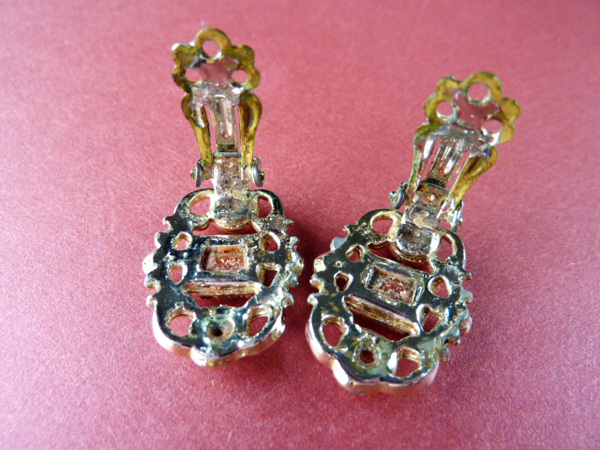 Earring clips have some scuffs and slight wear on the edges. 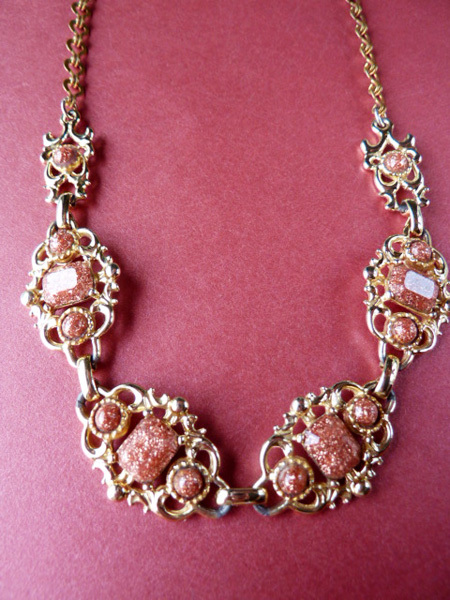 Antiqued-goldotne piece with lots of texture, nice quality piece. Robert Zentall operated from 1954 - early 1980s. 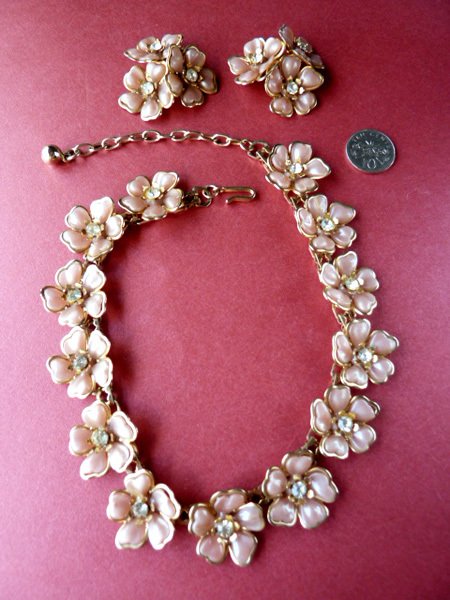 Probably from the 1950s. 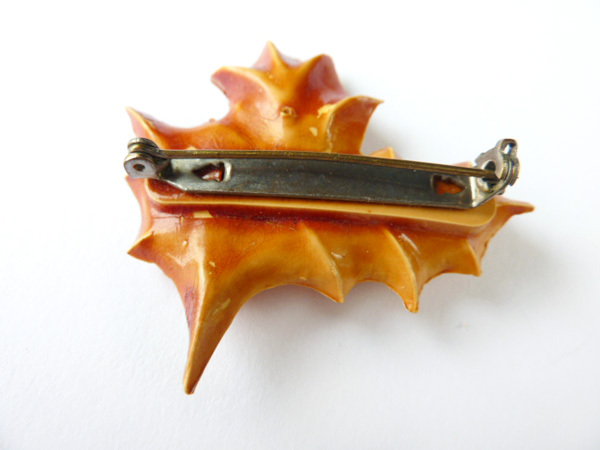 Fine condition, brooch has crackling brown glaze from age and that has chipped off on the fronts and back (see photos) revealing the base colour of the plastic, I believe someone has tested it with a hot pin too as the back has a small pinhole! The pinback has patina and is slightly bent. 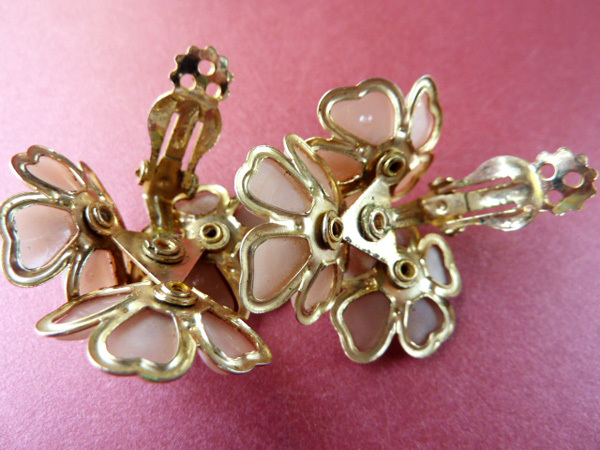 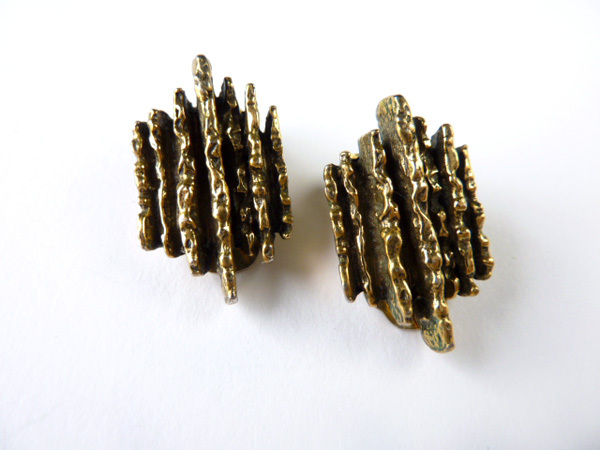 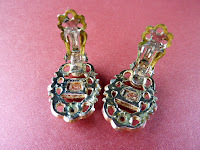 Earrings are in good condition, one earring has a small chip on the front, the other has no chips. 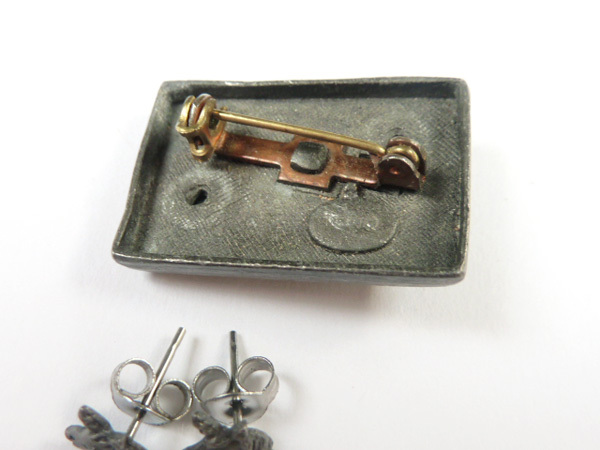 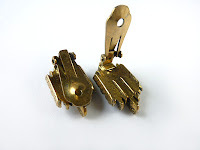 The screw-back clips have wear on the silvertone revealing the brass, and the brass in turn has a nice deep patina. 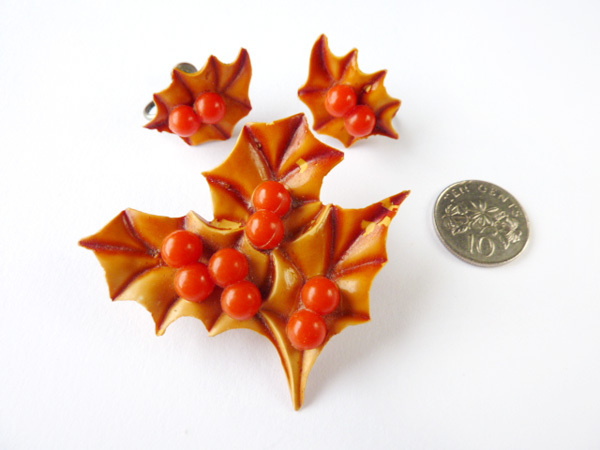 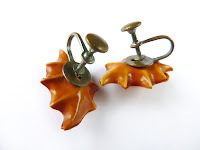 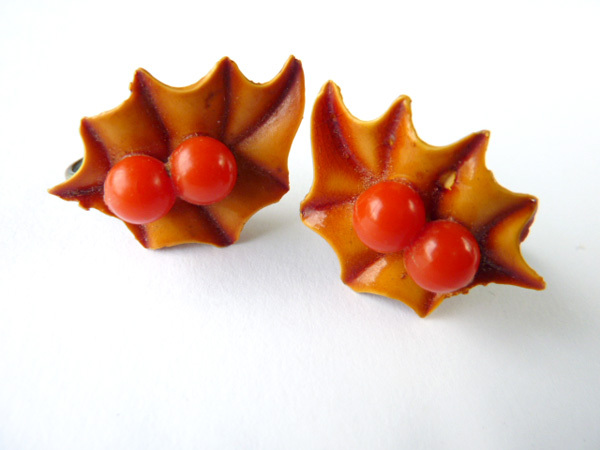 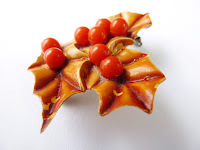 This set is made of celluloid from the 1940s, reddish brown colour with red berries. 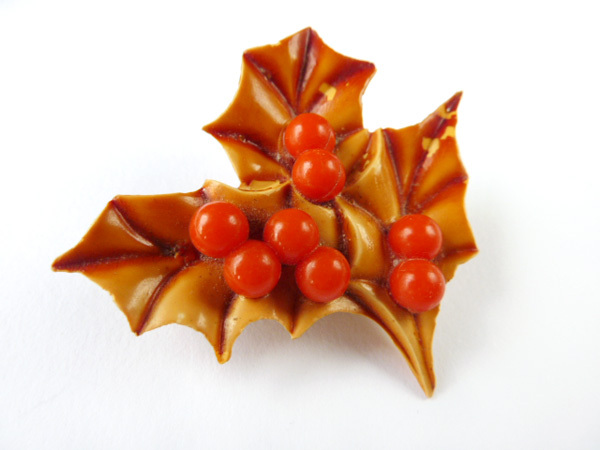 It is featured in the book 'Christmas Pins Past and Present' by Jill Gallina. 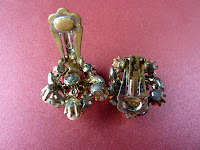 Signed 'TORINO ©' Good condition, slight scuffs on the back. 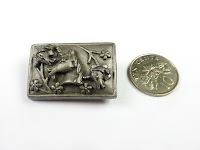 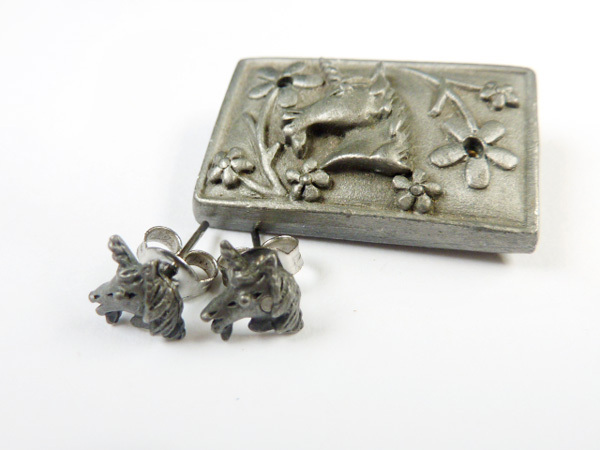 Pewter brooch with matching earrings, shows a unicorn with flowers.